This book is a compilation of the stories of 25 IIM- Ahmedabad graduates who opted to tread on the rough paths of entrepreneurship and successfully built new businesses and organizations. The author Rashmi Bansal, an IIM-A alumnus herself, writes that this book is for those people who seize their moments; for those who do not believe in selling soaps just because you are paid well to do so. It is about those who had the easy option of being a corporate slave, but felt that they had something bigger and better they could do with their talents. About people who did things which others thought were foolish and who decided to stay hungry in search of that something better. plan to become entrepreneurs but seized an opportunity when it knocked and capitalized on it. – Stories of those individuals who have used entrepreneurship to create social impact and/or as a platform for creative expression. All those featured in the book are diverse in age, in outlook and in industries they have made a mark in. But the one thing they had in common was that they believed in the power of their dream. The book reveals the making of iconic brands like Sintex, makemytrip.com, India Infoline, Mphasis, Renuka Sugars, naukri.com, GiveIndia and many more! 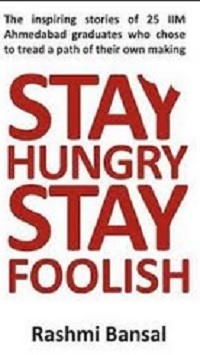 Stay Hungry Stay Foolish is written in a conversational format. The end of each story is punctuated with a page of advice for young entrepreneurs. The book elucidates how these individuals with fire in their bellies and stars in their eyes, overcame the odds to realize their dreams of being their own masters as they ventured into uncharted territories. 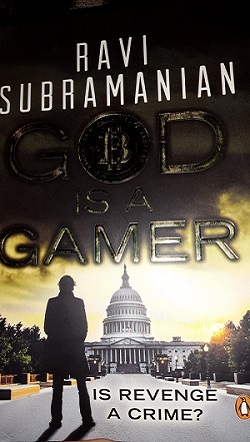 God is a Gamer is world’s first bit coin thriller written by Ravi Subramanian. The author uses the technology of virtual currency to create the mystery. It is the talk of the hour and worry for Aditya and Swami among others for the impact it is going to have on their organizations. The chapters are short and the story unfolds gradually in the second half. The book makes for an interesting read, the plot revolves around centre characters which are in someway related to the previous novel If God was a Banker by the same author. The plot takes shape in multiple locations like Mumbai, Delhi, Goa and Washington D.C and the characters possess an air of elegance. The locations range from the finance ministry in Washington D.C to the beaches in Goa. However the landscapes are described well and provide a refreshing touch. The romance makes for an interesting twist to the otherwise monotonous nature of the corporate culture. It is used as a way to step up in the corporate ladder too as hinted in some places. It is appalling to see the life of prime character like Malvika coming to an end so soon. It is only in the last parts of the novel that the suspense of her death is explained. It is also abysmal to see character flaws in what seem to be otherwise normal human beings. It is an amalgamation of technology and mystery, bankers and politicians and off course the iniquity. Boardroom politics in addition with mystery enthral the audience and make for an interesting read. New characters are introduced smoothly. However, the term bit coin is rapidly lost in the increasing plot. The author describes plot scene wise and location wise while maintaining the crucial balance between the two. Crime is fused with politics and served on the platter. The virtual currency attracts readers with a technical mindset but the read seems to be lost in the plot. The short chapters make for a quick read while travelling to and fro from work or otherwise and does not seem like uprooting the reader from the plot. It is story of the victory of good over evil and intermingles the concept with the idea of personal growth, interests and professional suicide, the idea of victim being the culprit and culprit hiding behind the veil. The interesting thriller has reserved the shades of grey for the center character and the suspense is revealed progressively. The suspect behind the bars is revealed to be otherwise. Previous reads from the author have been interesting ones and one expects similar experience from the latest thriller. If you are interested in thrillers, grab a copy of this book but do not expect much involvement on the bit coin or the virtual currency aspect of the plot. It definitely is discussed in a way so as to create the initial prerequisite but later fades into the other facet. Overall a good one time read for the suspense, the romance and the thrill and for some bit coins too.